Although I’ve always appreciated a good bowl of soup during the cooler months, it’s only been in the past couple of years that I’ve gotten so much utter enjoyment from a pot of soup created on my own stove. I just plain crave the whole process now. The chopping. The slicing. The browning. The simmering. And then sitting down with my family to enjoy all the warm-your-soul goodness. 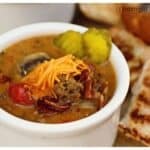 This Bacon Mushroom Cheeseburger Soup was inspired from a meal I had while visiting my parents last winter. If you could imagine a bacon mushroom cheeseburger (yum! )…in a bowl…this would be it! My mom always creates deliciously flavorful burgers. Due to her obvious love of onions, she mixes the ground beef with Lipton Onion Soup Mix. And then there is a sprinkling of black pepper and Lawrys seasoned salt on the formed patties before sending them on their way to the hot fry pan or grill. 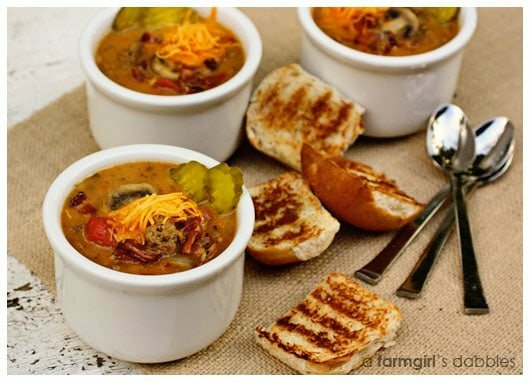 So I knew this soup needed to incorporate those familiar flavors from the burgers I’ve always adored. 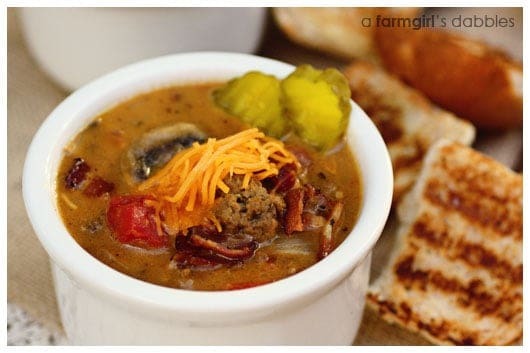 This beefy burger of a soup has been a big hit around here. Especially with the toasted garlic buns for dipping. More than one family member has told me these are not optional with this soup – they are a must. And I would add that the bright and sour contrast of a few dill pickle chips in your bowl will go a long, long way, too. What’s a bacon cheeseburger without dill pickle chips anyway?! When my friend, Morgan, of Morgan Mosiman Photography told me she had a great toddler photo shoot last week…with a gorgeous fall backdrop of Stillwater down by the river…well, I just had to see that autumn gorgeousness. And then I wanted to share it! If you are looking for a portrait photographer based in the Twin Cities (available to travel throughout Minnesota, Wisconsin, and beyond), please check out Morgan’s work. Morgan has taken photos of my family on several occasions and always delivers refreshing top-notch portraits. From newborns to high school seniors to families, she will perfectly capture your family through her lens. In a heavy pot with tall sides (a small to medium sized stock pot works great) over medium heat, fry the bacon. Remove to a plate lined with a paper towel to drain. Let cool, then roughly chop and set aside. Drain the bacon grease and return pot to the burner. Add the hamburger, breaking it into smaller chunks. Sprinkle with Lipton Onion Soup mix and stir. Once the hamburger is thoroughly browned, remove to another plate lined with a paper towel to drain. Set aside. Drain any hamburger grease from the pot and add the butter. Once it is mostly melted, add the onion, mushrooms, and garlic. Stir well. Cook until thoroughly softened, about 15 minutes. Add the browned hamburger back to the pot, followed by the beef broth, tomatoes, cheddar cheese soup, half and half, Worcestershire sauce, ketchup, mustard, cumin, chili powder, garlic powder, Lawrys salt, and black pepper. Let the soup heat up as you occasionally stir it. Once hot, stir in the sour cream and chopped bacon. Let it cook another minute or so, then serve with a garnishing of dill pickle chips and shredded cheddar cheese, with toasted garlic buns for dipping. Lightly butter the cut sides of each dinner roll. Sprinkle lightly with Penzeys Sandwich Sprinkle. Grill, cut/buttered side down, on a grill pan or griddle over medium-high heat until nicely browned. From a farmgirl’s dabbles, inspired by a soup I ate while visiting my parents.